I sought ProSportsDoc because I wanted to take my cycling to another level. 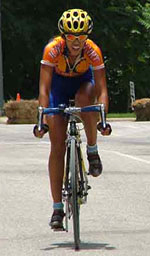 I have been racing competitively for over two years as a Category 4 woman cyclist (Category 1 and 2 being the elite levels). 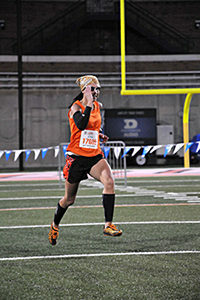 After dropping back in a race once, I clearly remember telling myself “I am tired of racing Category 4” and I made it a goal to become a Category 3 racer by the end of the year. It was a simple goal addressed with a lot of focus and discipline. I came to understand that success comes with focus, determination and confidence. Coupled with the right resources to train and to prepare smart, I became quite confident that I can reach Category 2 and that I can race at an elite level. To achieve my goal, I realized I need to raise my standard in training, fitness and attitude. I met Dr. Bartosh in the Czech Republic while visiting a friend in summer 2004. He told me he could help me become faster, stronger and smarter. Wanting every advantage, how could I resist? If I give it my all, I want to do it right. I came to Danville, Illinois not knowing what to expect. To be quite blunt, I had no clue or imagination as to what he could or plan to do. I just recognized there is always room for improvement. The amount of improvement within my four-days visit has been astounding! 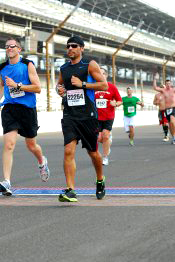 Racing competitively for so many years, I felt I was in competitive shape. During my examination with Dr. Bartosh, I realized my initial thought was incorrect! For example, I was shocked to realize how weak and irregular my pedal strokes were with my right leg in comparison to my left leg. I was surprised to hear my hip, ankle and leg were out of alignment. The list of need-to-be-fixed was long. I viewed it as a long list of potential improvements. If I was able to place 2 nd in the Florida State Time Trial with the body functioning as it was, imagine how I can do with an optimally functioning body! Indeed, after my visit, my efficiency improved greatly. My average speed, body fat percentage and breathing have noticeably changed during this short period of time! Even my pedal strokes have become more balanced and controlled so that spinning feels close to gliding on water. It is difficult to express my amazement as I witnessed my body change in such a short period of time! It is as the saying goes: You gotta be there to believe it. Above all, I came away with the most pivotal lesson from Dr. Bartosh. I use the word “pivotal” because he helped me elevate my attitude and mentality to that of an elite athlete. He often made an analogy of an athlete’s body to that of a machine – a race car. I now treat my body as such and present myself to reflect that respect. I came to Danville, Illinois with confidence and I leave with confirmation. Dr. Bartosh has helped me raise my standard –in cycling and in the quality of my life. 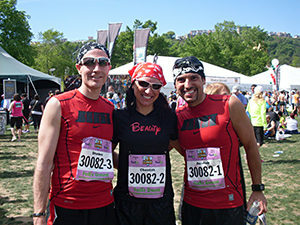 This past year was the first year for me take on an intense training program to accomplish many goals as they relate to running… including running my first half marathon. It is also the year I was fortunate enough to meet Dr. Bartosh. With the help of Dr. Bartosh and his many resources I was properly equipped with knowledge on how to prepare both physically and nutritionally for my various races. I was and am continually amazed at the expertise Dr. B has demonstrated while receiving chiropractic adjustments from him. He has found injuries before they surfaced! As well as put me quickly on the road to recovery for the existing injuries that arose during my training. All the while he had an explanation for the cause, and provided me with exercises and stretches to help prevent further injuries. In addition to keeping me physically ready for performance… Dr. B and his staff provided me with expert nutrition advice to keep me fueled for training and races, aid in recovery and maintain day to day wellness. I can honestly say that with his help , this year I was in the best shape both physically and nutritionally that I ever have been in all of my 38 years. On a personal note, I would like to say that you couldn’t find a more kind and down to earth provider. His bedside manner is impeccable.. and he makes a great cheerleader when you need one during an important race!! Every time he sees me Dr. Bartosh informs me that it’s his privilege to work with me, but the truth is, it definitely my privilege to work with him. I can honestly say that had it not been for the knowledge and abilities of Dr. Bartosh my running career would have been over before it began. 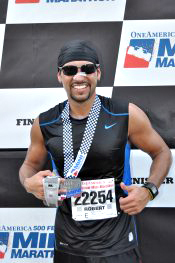 Having been running only four months, I sustained a severe injury to the knee which left my running drastically slower and with pain so severe, sometimes incapable of running. I knew that rest and taking time off would not correct the problem. Having heard good things about Dr. Bartosh, I decided to schedule an appointment as quickly as possible. Within my first visit he not only took the steps necessary to begin correcting the problem, but also found the weakness and cause of the initial injury and began to correct that injury so that it would not reoccur. 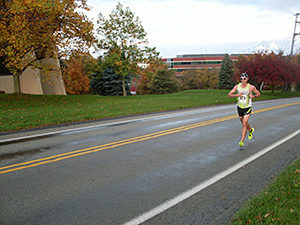 Within a handful of treatments, I was back to running and at the pace I had been previously accustomed to. With continued knowledge and care from ProActive Wellness, not only did they take me back to the level that I was at before sustaining the injury, but I have now surpassed all of the goals I had once set. With their continued help I look forward to surpassing my new goals. 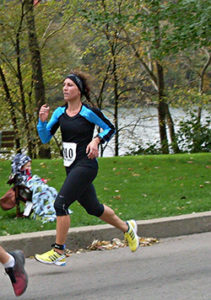 I’ve been running competitively for 15 years now, and have always heard comments about my odd stride. For years I tried to alter it by concentrating on proper form, doing drills, and so forth, but no amount of this made a difference. Finally, I was forced to confront the issue when I sustained a minor injury and went to Dr. B for help. In a matter of moments he was able to detect a substantial imbalance in my legs that accounted for my unusual gait and, likely, the injury itself. He performed a few adjustments and declared that, although significant changes would take long term treatment, I should see some results immediately. Given the fantastic results, I’m excited to go back for follow up sessions in order to make sure that these changes are maintained or even improved. I’m even more excited for the upcoming race season. I can’t thank Dr. B enough, and highly recommend his services. I wanted to thank Doctor Bartosh for helping me out with my knee injury that has been bothering and frustrating me for over 4 years. I have been an active athlete for over 28 years and competed on the recreational as well as professional level in many sports, (Hockey, Tennis, Soccer, Cycling). The pain has been getting progressively worse and it was starting to limit the amount of days I was able to exercise. After only 2 sessions Doctor Bartosh was able to help me using his technique and my knee hasn’t felt this good and strong for a long time. I am able to exercise 5 to 6 times a week again with better performance. Once again I would like to thank him and his staff for their professionalism and for the incredible results. PS: Doctor Bartosh was also able to put me on a nutrition program that help me gain my 50 pounds back that I’ve been missing for a while. Program goes as follows: 3 sausages links, 3 hotdogs and a gallon of chocolate milk shake for breakfast lunch and dinner. Every other day he allowed me to have dozen of donuts with breakfast. I’m now back to 250 pounds (I’m only 5’1” tall but 5’6″ wide) just where I should be! Thank you Doctor Bartosh for your brilliant nutrition program. I highly recommend it to anyone who would like to compete on a professional level. I would say a lot more but I have to get back on my program! 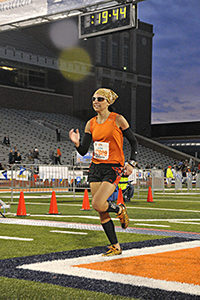 Three years ago she was physically unable to run. 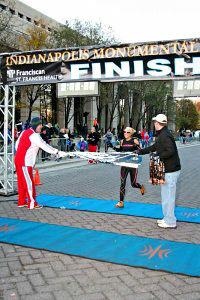 In November 2011 she won the Indianapolis Monumental HNTB 5K for the second year in a row. Watch her video below.